Elegant Painting produces the most flawless front doors on the eastside. We know your front door is the first thing your guests see, and we want it to be as perfect as the rest of the house, with a little extra touch of elegant flavor. As with most exterior projects, we start by rinsing off that fine layer of pollution with a pressure washer and allowing it to dry out. Preparation is key to producing a perfect front door. We start by removing the hardware, and any flaws we see on the door including runs left by previous painters, nail holes, cracks, chipping paint, bubble, etc. If the door has major dried paint runs or drips, we employ the services of our trusty fiber disk sanders to flatten them out. If there are cracks, we speckle then using MH Ready Patch Professional formula speckling and patching compound. This product is Shrink and crack resistant, dries rock solid, yet it is easy to sand and easy to apply. If cracks are visible in the joints, we use our premium Sherwin Williams® caulk, or the very durable WhiteLighting caulking material to make sure the cracks do not reappear after a few years. With flexible caulking, even if the crack continues to expand due to the settling of the house, the caulking expands and continues to seal the crack, stopping moisture from entering the joint. After the speckling, and filling of the nail holes, and the grinding of the runs, we hand sand the door with fine 2sandpapernd paper to remove any sanding marks and to smooth out any patching compounds. Cleaning sanding dust is not as easy as you would think. The most effective way of making sure there is no trace of dust left behind is to first direct a garden blower at the door while brushing every square inch with a clean dry brush. Once we are convinced all the dust is gone, the door is wiped with a clean, damp, lint-free cloth. Now the door is ready to be primed. There are 2 ways of making a front door. The first option is painting the door before the rest of the house is painted. This means we only have to cover the porch and not have to worry about getting paint on the siding, but if we are painting only the door, or if the door is being painted after the rest of the house is completed, then we mask off a six foot area all around the door and the casing. For this, we use 3M window masking plastic and tack it down to make sure the wind does not blow it off the surface. Then we open the door and mask the casing from the inside to make sure no paint can make it passed the surface of the door. 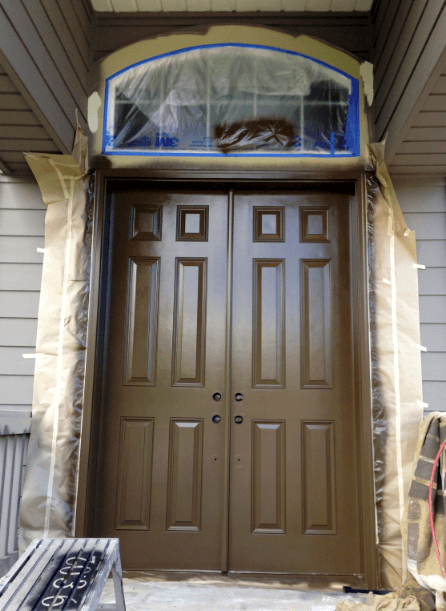 Unless you have a fiberglass or metal door in decent shape, you need a primer. Doors are often painted with high-gloss paints, which means your new coat has nothing to grab. Shiny paints do not allow anything to penetrate into them, hence the need for a good quality oil based primer. We have two nearly identical products to choose from; KILZ Complete, or Zinsser exterior oil based primer. How do we decide if a primer is needed or not? We make this decision after the preparation. You do not need a primer if your sanding has removed all the sheen out of the current finish and if you are working with a door that is currently in good shape. We also consider how protected the door is from the elements. If the front porch ceiling is protecting the door from rain and US exposure, then there might be a chance you do not need to prime it. If you are working with a wood door that has been sanded and speckled, then skipping primer is a mistake. We spray the oil primer using a Titan Airless Sprayer. This fast drying primer can be sanded in 1-3 hours. Once the primer is fully dried, we sand with a fine 220 grid sprayer and repeat the dust removing techniques mentioned above. Now we inspect the masking to make sure everything is intact and start painting our perfect front door. We like to use a Titan440i airless sprayer, with a 410 fine finish tip. The 410 fine finish tip puts out a very small amount of paint, so we count on applying 2-4 coats depending on color. Our paint of choice here is our wonderful Benjamin Moore MorGlo LowGloss. This paint dries out to resemble a layer of vinyl that is not too shiny, yet offers extreme protection for any surface. The paint is sprayed on in a checkered pattern. The spray gun trigger is pulled away from the door, then the gun is run up or down the height of the door until the entire door is covered. Then the process is repeated horizontally. After the paint has dried, The door is opened and the inside edge is painted with a brush, taking special care not to allow the brush to touch the sprayed areas. How do we know which edge should be painted the interior color and which edge exterior? Here’s a simple method; Stand outside and open the door. The edge you see should be painted the exterior color. If the interior of the door is being painted, simply repeat this method from the inside; any edge visible from the inside should be painted interior color. 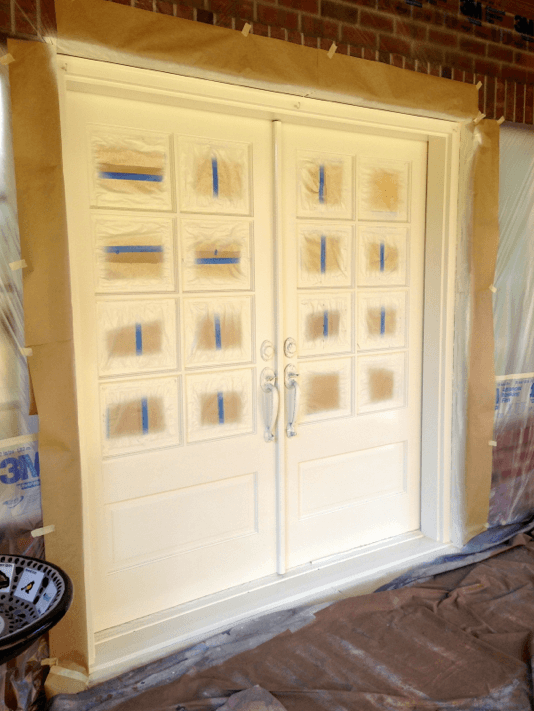 Once all surfaces are completely dried, which can take a few hours depending on humidity, we carefully remove the masking plastic and inspect the door and surrounding areas to make sure we have achieved the type of perfection Elegant Painting is known to offer. Posted in Procedures and tagged bellevue house painters, eastside painting, elegant painting kirkland, kirkland house painting, painting front door, redmond painters, sammamish painters.